In the present day NBA, there’s only a handful of teams that most general NBA fans would consider contenders. Most of those teams are in the Western Conference. Out west there are the Golden State Warriors, San Antonio Spurs, and Los Angeles Clippers. That leaves the only true contender in the East to be the Cleveland Cavaliers. The second tier teams in the Eastern Conference are constantly trading places and making moves to try and move into that elite “contender” category. The team that has the best chance to do that and rival the Cavaliers in the Eastern Conference Finals is the Toronto Raptors. Why are they suddenly contenders? The key for the Toronto Raptors has been their offense. Head coach Dwane Casey has a great offensive mind, and it’s shown. Ever since Casey became the Raptors head coach, their offensive statistics have been gradually getting better each season. The 2016-17 season has been extremely kind to the Raptors offensively thus far. Part of the reason for Toronto’s leap on the offensive end of the floor is thanks to their great backcourt of Kyle Lowry and DeMar Derozan, but especially because of Derozan. 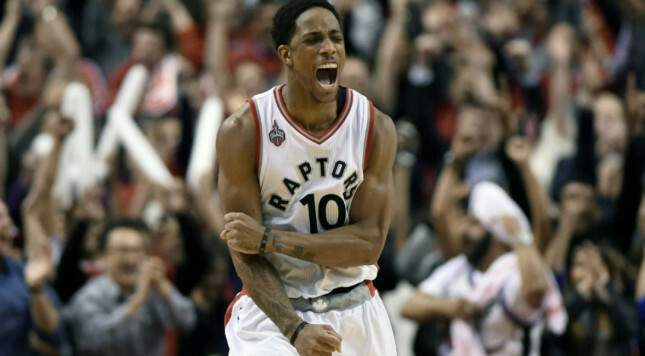 Derozan is currently averaging 28 points per game while shooting an incredible 56.4 percent from the field. The Raptors as a unit have taken a big step to becoming an elite offensive team. They’re averaging a whopping 113.9 points per 100 possessions, which trails only the incredible Golden State Warriors. This isn’t all about DeMar Derozan, though. Much of the Raptors success has been thanks to Casey’s offense. They play the traditional inside-outside game, with Valanciunas inside, Derozan inside and from the mid range, and Lowry and Ross being the main three point contributors. Valanciunas continues to improve constantly and provides a tough big inside who has a nice mid range touch. The point is, Casey is transforming his team into one of the best in the NBA differently than any other coach. Unlike the “super teams” in the NBA, the Raptors aren’t making big splashes in free agency. They’re drafting and developing. In a league where almost every good team becomes good based on free agency, the Raptors are doing it old school style. Will they rival Cleveland in the Eastern Conference Finals? They have the tools to compete with the Cavaliers in a seven game series. I believe they’re a power forward away from truly being contenders, but if they keep developing and moving in their current direction, they’ll be there in no time. The Raptors are currently 0-3 versus the Cavaliers this season, and it feels like they’re a year away from making the jump from competing with Cleveland, to beating Cleveland. I still think they’re in need of a big piece at power forward who will ramp up their defensive intensity, but won’t throw off their flaky chemistry on the offensive end of the floor. The Raps are very close to, but not quite there yet. Whether this is the year they make the NBA Finals or not, one thing has become clear: The Toronto Raptors are coming. Zac is the founder of Complete Philly Coverage. He is the editor-in-chief, and contributes to all aspects of the site. Zac is also a staff writer for Crossover Chronicles.